Almost two years after an Exxon Mobil Corp. pipeline split open and sent Canadian crude flowing through a neighborhood in Mayflower, Ark., federal regulators have quietly proposed a sweeping rewrite of oil pipeline safety rules. If the proposal is finalized in its current form, as much as 95 percent of the U.S. pipelines that carry crude, gasoline and other liquids -- 182,000 miles -- would be subject to the new rules and about half the system may have to undergo extensive tests to prove it can operate safely, according to information from the Department of Transportation's Pipeline and Hazardous Materials Safety Administration. The plan, known as the Hazardous Liquids Integrity Verification Process, is an implicit acknowledgment that some of the oil industry's testing technology isn't sophisticated enough to detect cracks or corrosion in time to prevent a pipeline's failure. And for the first time since PHMSA was created, it may wind up telling companies they have to replace certain aging pipelines. The oil and pipeline industries are already lobbying against the idea, saying PHMSA has overstepped its legal mandate. The types of tests that PHMSA wants to require are expensive and in some cases do more damage than they prevent, said John Stoody, vice president of the Association of Oil Pipe Lines. Richard Kuprewicz, an engineer who specializes in pipeline safety, said the rules could provide more protection for people who live near pipelines. "If the technical level of sophistication stays in the final regulations and isn't watered down, the answer would be definitely 'Yes,'" he said. PHMSA has been struggling for years with the rapid runup in oil and gas production driven by hydraulic fracturing and horizontal drilling in shale. The amount of crude pumped in the United States has jumped nearly two-thirds in the past five years, forcing companies to re-plumb the North American pipeline network. In places like North Dakota, there aren't enough pipelines to move all the newly found oil, so it's being shipped in mile-long trains. The tanker trains have been involved in a string of accidents in the United States and Canada, and PHMSA has been working on new regulations to keep rail cars from exploding when they derail. The bulk of oil, gasoline, diesel and other fuels -- which PHMSA lumps together as "hazardous liquids" -- is still shipped by pipeline, though, and the U.S. pipeline network is showing its age. Half of the oil and liquids pipelines in the country were built before 1970, according to PHMSA, and companies are continually reversing pipelines to serve new markets or converting pipelines to carry new products. PHMSA hasn't done much to publicize the pipeline safety proposal and hasn't published either a proposed rule or an advance notice of a proposed rulemaking. Nothing about the Hazardous Liquids Integrity Verification Process appears during a routine search of the agency's website. EnergyWire obtained a PowerPoint presentation and other documents about the proposal from DOT's regulatory docket. PHMSA declined to make any of its officials available for interviews over a five-day period and wouldn't answer written questions on the record -- even though the agency has already briefed two oil industry trade associations about the proposal. The biggest change in the proposal would be in how operators determine a pipe's maximum operating pressure -- the level beyond which it can start to leak. It's a crucial number because a pipeline's pressure determines how much product it can transport. Ideally, the owner of a pipeline would be able to verify a pipe's safe pressure with documents showing how it was constructed and how it was tested before it went into service. Most new pipelines are hydrostatically tested -- meaning they're filled with water and pressurized to see whether they leak. Aerial view of fire from the Carmichael, Miss., explosion showing nearby destroyed houses. Photo courtesy of the National Transportation Safety Board. But a safe pressure can't be verified on a good portion of the pipeline network. Since the 1990s, PHMSA has been allowing companies to use a combination of engineering calculations and tests with inline instruments known as "pigs" or "smart pigs" to determine the pressure. The pipeline industry prefers pigs over other types of tests because they're relatively cheap and fast -- meaning pipes don't have to be shut down very long. They use magnets, X-rays and other technology to measure the pipe's thickness and check for problems. 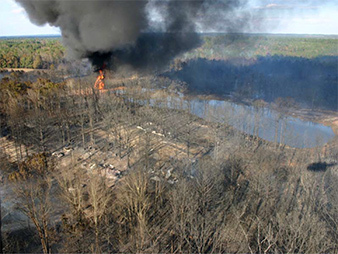 A string of pipeline accidents, including the Mayflower spill and a deadly 2007 explosion in Carmichael, Miss., have shown the limits of the current system. Both of those lines were built with a type of longitudinally welded pipe that's prone to cracks and corrosion, as is about a fourth of the U.S. oil and liquids network. The National Transportation Safety Board has been warning PHMSA and its predecessor agencies about the dangers of the tubing, known as low-frequency electric resistance welded (ERW) pipe, since an explosion that killed five people in Whitharral, Texas, in 1976. PHMSA and its predecessor agencies typically deferred any final action. Then came the accident in Carmichael on Nov. 1, 2007, on the Dixie Pipeline. The section of the 12-inch line that burst was manufactured in 1961, according to the NTSB. It was transporting liquid propane at a pressure of about 1,405 pounds per square inch when a 52-foot gash opened along the length of the pipe at about 10:35 a.m. The pipe released 430,000 gallons of propane. About four minutes after the rupture, a resident in a house about 500 feet from the pipeline called 911 to report smelling gas and seeing a white cloud in the area, according to the NTSB report. Seven minutes after the rupture, the cloud of gas ignited, causing an explosion and a fire that burned until the next day. Two people were killed -- including the victim who had called 911 -- and seven people were injured. The pipe had been inspected with inline tools in 2005 and 2006, but the tests didn't show any problems near the site of the 2007 rupture. In 2009, the NTSB recommended that PHMSA conduct a comprehensive review of ERW pipe, including whether inline testing was effective enough at finding cracks and other problems to prevent future ruptures. The study was still underway when the Pegasus line ruptured in March 2013, sending 5,000 barrels of oil coursing through the streets of a small subdivision. Like the Dixie Pipeline, the Pegasus line had been inspected with inline tools before it ruptured. About seven months after the Pegasus accident, the PHMSA report on ERW pipeline was finalized. It found that although inline tests could find some dents and cracks in a pipeline, they aren't sensitive enough to classify those problems and predict when a pipe may fail. PHMSA's solution -- the Hazardous Liquids Integrity Verification Process -- would go beyond the ERW pipelines and include most pipelines in urban or other high-consequence areas, and lines carrying highly volatile liquids, such as propane. It would also include pipelines that run in the right of way for highways or arterial roads. Pipelines that can adequately prove their maximum operating pressure would be allowed to keep operating. PHMSA estimates that operators would have to re-prove the maximum operating pressure for about 98,100 miles of pipeline, according to its presentation. "The question is -- do we really have 50 to 60 years' worth of historical documents showing us the health of the pipeline?" said Brigham McCown, a former administrator at PHMSA who reviewed the presentation. The document lays out a range of options for determining the safe pressure. At the top of the list is hydrostatic pressure testing. In some cases, operators may be required to do "spike" tests -- pressurizing the pipe past its prescribed limits to see if it holds. The list also includes replacement, which is something PHMSA has rarely recommended in the past. Just mentioning a requirement to replace pipelines is a change in posture for PHMSA, McCown said. Up to now, pipeline regulations have been performance-based -- if a company could repair a piece of pipe and demonstrate that it met the regulations, it was allowed to keep operating. "PHMSA doesn't tell people they have to replace pipe," McCown said. It's not clear how often pressure testing or replacement would be required. The list of options also includes lowering a pipeline's operating pressure or doing engineering calculations to determine its safe operating pressure. But the oil industry is already questioning the need for more tests. Pressure-testing thousands of miles of pipe would not only disrupt the energy business, it could also damage the pipelines, said Stoody, with the pipeline association. "If you do it for too long, you actually burst the pipe or you actually cause cracks," he said. And forcing the industry to replace pipelines would cost billions of dollars, which could divert companies from their main focus, which is protecting pipelines in urban or other sensitive areas, Stoody said. "If you're spending money replacing good pipe, that's money you didn't spend somewhere else," he said. The pipeline association and the American Petroleum Association also questioned the legal basis for the rules in a joint letter. Congress explicitly told PHMSA to require pressure testing of gas pipelines when it rewrote the pipeline safety laws in 2011. That was in the wake of Pacific Gas & Electric's 2010 explosion on a gas pipeline in San Bruno, Calif., which killed eight people. Congress didn't impose a similar mandate on oil and liquids pipelines, the two trade associations said. Kuprewicz, the safety engineer, said PHMSA has plenty of legal authority to impose new tests on the pipeline industry. James Hall, a former NTSB chairman who's now a transportation consultant, said the trade groups' position is shortsighted. Oil transportation is a growing business, and pipelines are the safest way to move those products, he said. If the industry can't demonstrate its safety, it could wind up like the railroad industry, which is under intense pressure from the public and from regulators because of the string of oil-train accidents. "The smart players are the safe players in the pipeline industry," Hall said. "They're ones who make the investment up front and don't have the embarrassment of continually having to pay claims and bear the moral responsibility of deaths and injuries from pipeline accidents." Correction: The photo was originally said to be from Mayflower, Ark., explosion. It has been corrected to say it was from an explosion in Carmichael, Miss.